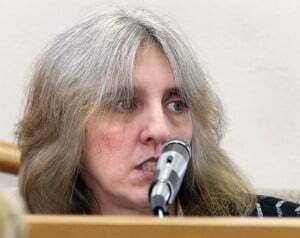 Tammy Cole testifies in May 2011 during her trial for the first-degree intentional homicide of her 53-year-old ex-boyfriend Vance Evans. SPARTA — It took a Monroe County jury three hours Friday to convict an Illinois woman for first-degree murder in the death of Vance Evans. Tammy Cole sobbed uncontrollably Friday as she told a jury how she accidentally shot Evans April 26 but didn’t shed a tear when the jury announced its guilty verdict in Monroe County Circuit Court. "This was not an accidental shooting to the middle of the back of the head," Monroe County District Attorney Dan Cary told the jury. "This is not a contact wound. This is an execution." Cary argued Cole, 47, shot Evans when he rejected her, then tried to ignite his Tomah house at 316 Woodard Avenue to conceal evidence. The jury convicted Cole of first-degree intentional homicide with use of a dangerous weapon and attempted arson. The trial lasted five days. "I'm very happy because she killed my father and now she's going to get what she deserves," said Evans' son, Travis Evans. A life sentence is mandatory, but a judge could make her eligible for extended supervision after 20 years. She will be sentenced at a later date. The final witness in her trial, Cole kept her chin tucked and cried Friday during her inconsistent five-hour testimony, showing the courtroom gallery only her graying hair from the witness stand. She testified that she surprised Evans, who she said was her boyfriend, at his home late April 26. They hugged and kissed before Evans' girlfriend Mary Mclain called. Evans, 53, talked to Mclain outside long enough for Cole to text him, "Can u come and say goodbye?" "It might as well have said, ‘Can you come in here so I can kill you?' because that's what the evidence shows," Cary said in his closing argument. Cole testified Evans returned inside upset, declaring that she "ruined everything." "He told me he had me in Illinois and someone up here," she said. Cole told him to choose. She believed he did when he kissed her. Cole wanted Evans to notify the other woman, but Evans forced her to call Mclain, Cole testified. "I might have said I was going to kill her, but I didn't say anything about shooting," Cole said. Mclain testified an unidentified woman threatened that "she was going to shoot me dead." Cole lit a candle upstairs for ambiance after the phone call, then hugged and kissed Evans before removing a Coors Light from his hand. Searching for a place to set the can, Cole found a loaded .38-caliber revolver on the coffee table. Evans was depressed and drinking, Cole testified, and she wanted it out of the room. "I picked it up, just kind of grabbed the handle, and held it by my side because I wanted to hide it," she said. "I was going to hide it in the kitchen." Evans grabbed her for a hug as she walked to the kitchen and the two locked in an embrace. Cole had the loaded revolver in her right hand just above his waist. "We stumbled," she said, pausing to sob. "The gun went off." Evans collapsed. She tried talking to him. He didn't answer. "And then the blood started coming out of his head and his eyes were just staring open," Cole testified. The bullet tore through his head before landing in an interior door frame. Panicked, Cole stashed the revolver in the oven, kicked out the stove's gas line and sat on a bed. "I just wanted to die because he was dead," she said. "Did you call emergency services?" Cary asked on cross-examination. "You didn't call police, right?" "You didn't call the fire department, right?" "You didn't call the public utilities company to have the gas shut off, right?" "You were really trying to cover up what you had done, correct?" A state firearms expert testified Thursday the Spanish .38-caliber revolver could not fire accidentally. "Old as it is, it functions just the way it's supposed to," William Newhouse of the state crime laboratory said. Newhouse testified that unique markings on a bullet recovered from an interior living room door frame indicated it was fired from the revolver. Responding officers found the gun in a kitchen bucket, natural gas pouring from a broken stove gas line and a lit candle in an upstairs bedroom. A microscopic examination of the damaged copper gas line showed the tube wasn't cut or sawed, Newhouse testified. He couldn't say whether the split could be natural. "How the break occurred, I have absolutely no idea," he said. State crime lab forensic scientist Samantha Delfosse testified she couldn't recover DNA from the gas line. She found DNA traces from at least four people on the grip of the revolver, but could not develop a profile or exclude Cole's DNA from the gun. Cole's DNA recovered from the mouth of an empty beer can in the kitchen sink revealed she drank a Coors Light sometime before or after Evans was killed. Delfosse also found Cole's DNA inside a pair of black leather gloves thrown on a stack of kitchen dishes. A shoeprint impression left on a vinyl mat on Evans' porch and another in the sandy soil outside the home matched a black boot confiscated from Cole's Big Rock, Ill., house, crime lab examiner Charles Cates testified. Cole's cellphone records show it traveled from Illinois to Tomah on April 26 and back the next morning, according to earlier testimony. Her phone called Evans repeatedly the night of his death and sent him a text message at 9:53 p.m.
"Can you come and say goodbye?" it read. Cole's sister Cindy Sturm testified earlier that Cole surfaced in Illinois the morning of April 27, confessing to an "accident with a gun." Cole fled Evans’ house when her attempted suicide failed. She testified she didn't remember driving back to Illinois, where she met her sister to confess "an accident with a gun." Cary pointed out in his closing argument that analysts did not recover gunshot residue from Evans' clothing. Cary offered Cole his version of the shooting, telling her "that you stood behind him while he told you he didn't want you and you shot him." Cole told the jury she didn't know how the gun moved from the oven to where officers found it in a trash can. Her black leather gloves found on a stack of dishes fell out of her purse when it tipped, she testified. Her attorney, Kristine Peshek, called the shooting a "tragic accident" and tried to convince the jury a cocked revolver could easily fire. "A simple slip of the finger could kill in a fraction of a second," she said. "Tammy Cole is the last person who wanted to see Vance Evans dead." Cole's second attorney, Michael Rabbitt, said they were stunned at the verdict. They are discussing an appeal. "We were emotionally invested in this case," he said. "But you have to respect the jury's decision." Twelve jurors who deliberated the verdict in the Tammy Cole murder trial were outed by the Monroe County Democrat newspaper. I know this phycopath from my child hood. Trust me she did it I hope she dies in a prison fight. I hope it slow n painful.